Hey Friends! Let me start by saying there IS more than one advantage to having almost-no-hair. Today, in the Texas heat and humidity, the big advantage I see is NO FRIZZIES. Oh, and listen! 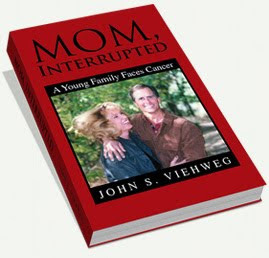 If you're in the mood for a real tear-jerker but want it to be really-real, pick up a copy of "Mom Interrupted". I love how the author says it how it really is. You know how we tend to idolize those who have passed on? Like they were never really human? John Viehweg doesn't talk about his lovely wife that way. Which is why I really believe she was an incredible person! I believe he paints a true picture of her and that's why I cried so much at the end ... I felt like I'd lost my own best friend. I always love to get a good book or movie review from a trusted friend. So, my blogging friends: what do you recommend? This sounds like an amazing book. Thanks so much for commenting on my blog. Kises my dear and have a good Tuesday! Oh I just adore your hair...you look beautiful and I too agree with Tuesdays and Morrie!!! come by and have a look at my artwork and tea cup tuesday post! Sounds like a great read. I remember Ken Wilber writing about the cancer of his wife was very moving; sadly I don't know the title of the book anymore. You do look lovely with short hair. Good to know it's practical, too. The very first book we read for book club was called "Left to Tell: Discovering God Amid the Rwandan Holocaust" by Immaculee Ilibagiza. Fantastic and inspiring. I also love-love-loved "The Glass Castle" by Jeannette Walls. She was a "normal" girl in a crazy (literally) family. It was riveting. But you have to have a tolerance for swearing by crazy people. Another book I absolutely loved is "The Prizewinner of Defiance, Ohio" by Terry (?) I can't remember the last name but you could look it up. It was about a woman in the 50s with a strained marriage, a lot of kids, and a knack for winning contests (for example, commercial jingles). And I love you, Denalee! Having curling hair which I tend to have it straigthened, I can certainly relate to the no frizzies advantage... The photo of you and your mom is so sweet! Thanks for the suggested reading. Two books that I really enjoyed and often skim through on my not so great days is - "Time Alive" by Alexandra Stoddard and "for one more day" by Mitch Albom. Ooh I'll have to check that out. I just read The Choice by Nicholas Sparks. It is a great love story (as usual) but I cried for days. ah, so you're a fellow Texan- than yes, amen to no frizzies- and I say it again, you are gorgeous! inside and out! Oooh yes, totally Tuesdays With Morrie! I know what you mean...the Alabama heat this weekend made hair an annoyance, not an accessory. I recommend Pretty Is What Changes. It's about a woman's choices about gene testing for BRCA. Incredible story. This sounds like a great book, can't wait to check it out. Frizzies are my big pet peeve with Florida so you are lucky! I love your blog, it's so uplifting! My good friend just read the Viehweg's book. We live in the same town as their family. She said the book was really good. Ok, now I have to read this because it is definately my kind of book. Denalee, you simply must read The Glass Castle. What an amazing true story of courage.